Evolution is a Functional Medicine Practice Specializing in Bio Identical Hormone Replacement Therapy, Weight Loss, Personalized Lifestyle Medicine and Nutrition Programs. Erin Bolton, the Weight Loss and Nutrition Counselor holds a board certification in Obesity and Weight Management. We strive to combine the best of both worlds so that we can deliver the upmost efficient services that will result in living a more optimal, longer, healthier and happier lifestyle. At Evolution, we get to the root of your problems with our functional medicine testing and eliminate your symptoms with customized treatments that will cater to your body's blue print without having to depend on medications that cause side effects. Erin, along with our new D.O., Dr. Robert Hannum, see patients at Baywest Health & Rehab in New Port Richey where evening hours are available Wednesday's and Thursday's. Erin has been specializing in Functional Medicine, Hormones, Weight loss and Nutrition for 8 years. While Dr. Robert Hannum has been practicing for 28 years, with a background in functional medicine for over 20 years. Please click here for more information. She is a graduate of Rutgers University (2005) and has studied weight loss, behavioral health, psychology, science and nutrition the majority of her career. She was also in charge of the fitness program during her military career of 10 years. Countless patients agree that they have never met anyone as passionate and knowledgeable as Erin to help guide them to optimal health and weight loss. Here at Evolution, we will get to root of your obesity or the reasons why you aren't feeling well and treat it once and for all. We will spend time with you, listen to your needs and look at your entire body's blue print to see how it functions with our testing. Whether you suffer from obesity, fatigue, a hormonal imbalance, inflammation, depression, or insomnia know we are here to give you the freedom to live optimally. 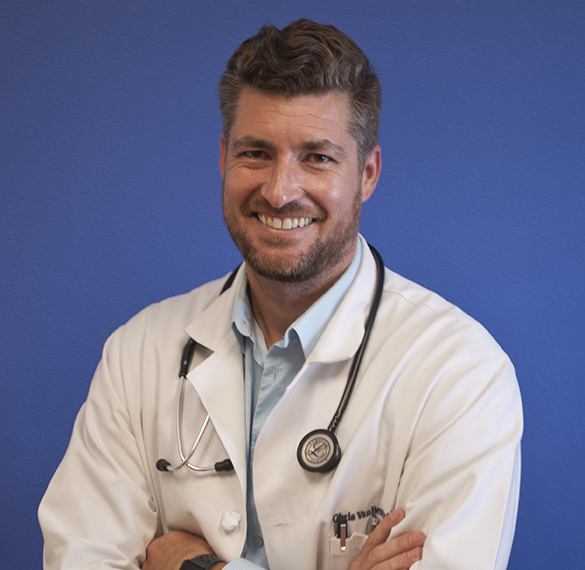 Dr. Christopher L. Van Benschoten M.D has experience in Family Medicine, Pediatrics, Anti-aging, and Medical Cannabis. He graduated with a Doctorate at St. Matthew’s University School of Medicine after graduating with a Bachelor of Science from the University of North Florida. He is a highly skilled physician with a passion for anti-aging. He completed his residency as a Family Practitioner and was an Ambassador Physician Hospitalist in New Smyrna Beach, Florida. In June 2005 Dr. Van Benschoten presented his work on Cord Blood Banking of Hematopoietic Stem Cells From Umbilical Cord Blood: An alternative Approach For Treating Acute Lymphocytic Leukemia at the University of North Florida senior research seminar. In November 2011 he spoke about Radiological Aspects of Childhood Craniopharyngioma at the Florida Hospital radiological conference case presentation. In March 2012 Dr Van Benschoten spoke about Pediatric Brain Tumors at the Interfaith Medical Center Pediatric Presentation. Dr. Van Benschoten has volunteered his time at Green Gables Assisted Living Facility, 5K Run for Autism and 5K Run for Breast Cancer. He was also a Field Research Intern for the U.S Geological Survey in 2005. Dr. Christopher Van Benschoten’s hobbies include traveling, surfing, outdoor activities and photography. Vijay Raj, M.D. has over thirty year's of experience in Primary Care, Public Health and Preventative Medicine. He is a graduate of Tulane University School of Public Health with a Master of Public Health & Tropical Medicine and a Bachelor of Medicine and a Bachelor of Surgery from the University of Delhi. Dr. Raj also has over thirty year's of diverse clinical experience in various areas of Military Medicine to include work at Family Medicine Clinics, Troop Medical Clinics, Occupational Medicine Clinics, Warrior Transition Units, Military Entrance Processing Station, Integrated Disability Evaluation System and the US Navy Medical waiver authority. Dr. Raj holds numerous certifications to include the American Board of Disability Analysts, American Board of Quality Assurance and Utilization Review Physicians, American Academy of Pain Management, Federation of Licensing Examination, Education Commission for Foreign Medical Graduates, American Heart Association and Florida Medical Association Physician Medical Marijuana Course. Dr. Raj served as a Major in the U.S. Army Reserve, Medical Corps, and has thirty years' of service in the Government of the United States. He was also on Active Duty in support of Operation Desert Storm in 1991. Dr Raj is passionate about patient care, functional medicine and has years of experience treating patients and is certified for Medical Marijuana.